Alibaba.com Wholesale is the leading Business-to-Business (B2B) e-Commerce platform that enables products to be easily sourced directly from suppliers in China. Source from Alibaba.com is the first iteration of our Alibaba integration. Within this release, you can install from our app store and immediately start discovering new potential products lines and suppliers from within Brightpearl. Better still, any products you take a liking to can be created in Brightpearl through the app, saving you time later on! Source from Alibaba.com is available for free, directly from our app store. Select App store link at the top of any Brightpearl screen, locate the app and select to install. That’s it! Once installed, you’ll find an additional action available to you from the product listing (Products > List products). Selecting to ‘Source from Alibaba.com’ will open the app in a modal. 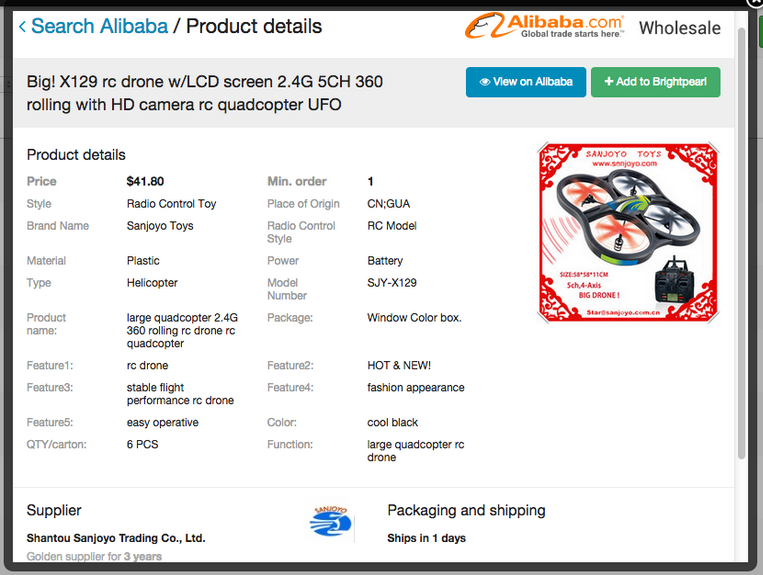 From here, you can immediately start browsing Alibaba’s product catalogue. Enter a keyword to get started, or select Show Filter to access a list of categories and other criteria to refine your search results. Once you’ve entered criteria, hit Search and we’ll retrieve the results. To view a product in more detail, simply click on its name to be taken to our detailed view. Our detailed view shows all of the product details, but additionally some information on the supplier (bottom-left) and any packaging and shipping information available (bottom-right). 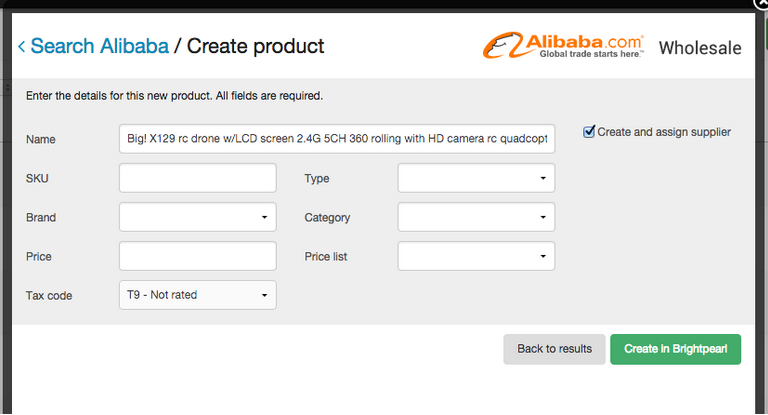 From here, you can select View on Alibaba to be taken to the product’s page on Alibaba’s website, where you can look through any additional information and contact the supplier. You can also select to + Add to Brightpearl (detailed in below section), or select Search Alibaba at the top to be taken back to your search results. Should you want to place an order for a particular product, you’ll need to add that product into Brightpearl so that you can add it to a purchase order, and then receive inventory against it when the stock arrives. You can of course do that through Brightpearl’s other features such as our import tool, however if you were to select + Add to Brightpearl then you’ll find a streamlined tool that can make this really easy. Here you’ll find fields for all the core information Brightpearl needs to make a product. Name we’ll fill in for you from the Alibaba product’s name, but you can amend this as you wish. Type , Brand and Category are all required for product creation. Each of these fields is a dropdown of the existing options available in your account, but also have an option to ‘Create new’, so that you can create one on the fly rather than diving into Brightpearl’s settings. Enter a Price (that you’ve perhaps negotiated with the supplier), and select the Price list you’d like to record against. Finally, select a Tax code and hit Create in Brightpearl , and we’ll do the rest! For more information on product creation and these fields in Brightpearl, check the product section .